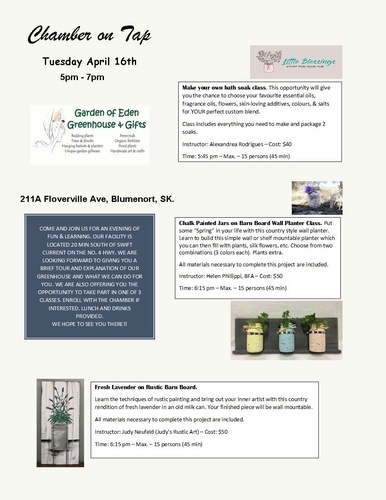 Sandra and her staff from Garden of Eden Greenhouse & Gifts welcome you to come and join them for an evening of fun & learning. Their facility is located 20 min south of Swift Current on the #4 Highway. They are looking forward to giving you a brief tour and explanation of their greenhouse and what they can do for you. Lunch and drinks will be provided. Also they are offering you the opportunity to take part in one of 3 classes, this is optional and requires registration. Make your own bath soak class. This opportunity will give you the chance to choose your favourite essential oils, fragrance oils, flowers, skin-loving additives, colours, & salts for YOUR perfect custom blend. Class includes everything you need to make and package 2 soaks. Chalk Painted Jars on Barn Board Wall Planter Class. Put some "Spring" in your life with this country style wall planter. Learn to build this simple wall or shelf mountable planter which you can then fill with plants, silk flowers, etc. Choose from two combinations (3 colors each). Plants extra. All materials necessary to complete this project are included. Fresh Lavender on Rustic Barn Board. Learn the techniques of rustic painting and bring out your inner artist with this country rendition of fresh lavender in an old milk can. Your finished piece will be wall mountable. Learn how to plant and care for succulents by taking part in this easy and fun planter class.